Lucha, mezcal, beer, tacos: What more could you ask for? 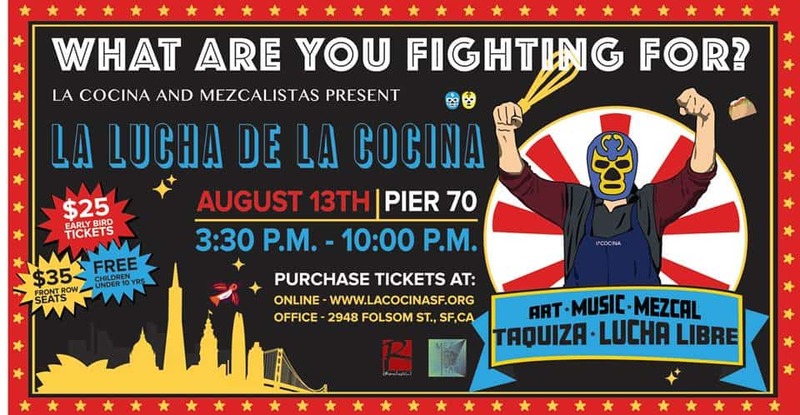 First up, the proceeds from this event go to support La Cocina, a Mission District non-profit which incubates female cooks as they build their businesses into local powerhouses. Find out more about their mission and all their awesome chefs at their web site. Hint: The model for our poster is a chef! 3:30-10PM Saturday, August 13th. We realize that some people really love lucha so you can also buy the “El Ring All-Access Package” to get in early, between 2:30 and 3:30 when you’ll get to have your photo taken with a favorite luchadore. Cocktails, mezcal, beer, tacos will be served for the duration of the event. ABV will be serving up “The Paloma Rosada” featuring Espolon tequila and “El Maximo” powered by Del Maguey’s Vida mezcal. Old Bus Tavern will be throwing down a special take on their “OBT” with Espolon Tequila and fiery poblano chiles. They will also be serving the “El Santo,” an Ilegal Mezcal fueled treat. Novela, working with theBon Vivants, will be packing the punches with their Tito Santana, The Man of a Thousand Masks and Pepper Gomez featuring Montelobos Mezcal, Ancho Reyes and Wild Turkey 101. Last but not least by a stretch we’ll be featuring a taquiza aka a taco party! You can sample and vote on your favorite tacos from some of the slamminest taquerias in the Bay Area. Here’s the full list, keep reading, it’s meant to wow you and I’m sure the tacos will.